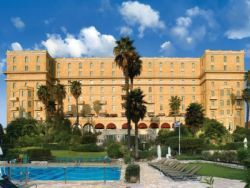 For the first 5 nights, we'll be staying at the King David Hotel in Jerusalem. One of the world’s legendary hotels, King David is a major landmark in a unique city, blending the refinement of the past with modern amenities and luxury accommodations. Superbly located on an elevated site, the hotel has one of the best locations in Jerusalem with incomparable views of the Old City walls, minarets and domes. Surrounded by luscious lawns and gardens, it features a splendid swimming-pool, tennis courts, fitness center and a spa to offer relaxation after days of sightseeing. Traditional Israeli as well as international cuisine is served at 4 restaurants. The rooms are steeped in luxury and comfort, and are designed for relaxation. Many of the rooms have views of the Old City and Mount Zion and all have air-conditioning, LCD TVs, safes, minibars, desks, and free WiFi. The sumptuous marble bathrooms come with bath tubs, hair driers and luxurious toiletries. 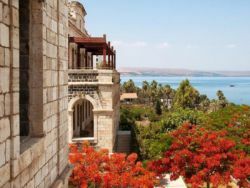 We'll spend 3 nights at the Scots Hotel in Tiberias, on the shores of the Sea of Galilee. This luxurious, historical property uniquely combines the 19th century basalt walls with a modern, international level luxury, and the synergy between the new and the old creates an atmosphere of calmness and mystery. The Torrance Restaurant serves gourmet food, including Galilee specialties, the wine cellar is stocked with local and international wines, and there is an on site art gallery and a spa. The interior decor combines the historical character of the buildings with the comfort required of a 5-star hotel. The rooms are designed in soothing, warm colors and the furnishings are comfortable, yet sophisticated. The rooms have individually-controlled AC, minibars, flat screen, plasma TVs and tea/coffee makers. The modern bathrooms have separate showers, hair dryers and feature upscale toiletries. Some rooms overlook the Sea of Galilee. There is free WiFi throughout. 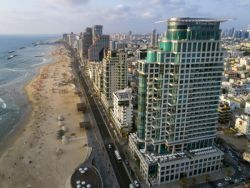 At the conclusion of the tour, we'll spend two nights at the Royal Beach Hotel in Tel Aviv. This exclusive collection property is located on the Tayelet Boardwalk, close to the Carmel Market and Nachalat Binyamin Street Market, and it offers an outdoor, rooftop pool, a spa with saunas, massages and Turkish baths and a fitness center. Free Wi-Fi is provided throughout the hotel. The hotel is home to the West Side Restaurant, a gourmet kosher restaurant with an extensive menu. The lobby bar offers kosher food and drinks and room service is available 24 hours a day. Located at the hotel is the digital art hub DigArt which presents more than 800 works of art by upcoming Israeli artists. All rooms are luxuriously designed and fitted with top quality furniture, providing a relaxed and laid-back feel. They all include a work area, an LCD TV, a mini-bar and seating area and a modern bathroom with complementary toiletries.